Our boys just aren't quite sure what to make of Hallow-whata-day! It's about wearing a costume, getting candy, attending a church event, and that's about the extent of it." It's not about Jesus," they would say. But it's more than pumpkins and falling leaves to them. They certainly enjoy every moment of it. Our boys joined forces with their close friends and represented the Rebel Force well. 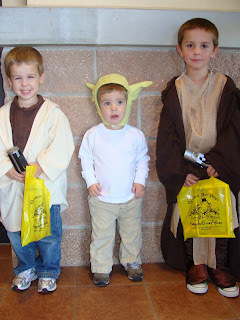 They love seeing other kids dressed up as different characters. This year, they were drawn to other Star Wars characters, almost as if the Force drew them together and they gave this head nod to these stranger kids as a way of identifying with them. It was pretty humorous to watch. 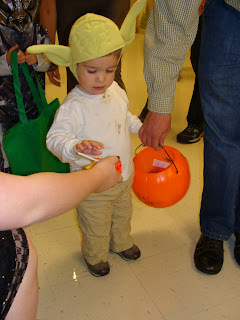 Asher didn't understand why everyone wanted to put candy in his pumpkin, but he certainly was liking it! We saw a Peter Pan show with an amazing Gospel presentation of Jesus as our Rescuer and played festival games to earn prizes. After a full day of fun and while the boys were getting ready for bed, we sorted through the candy and gave the Tootsie Roll the "most popular candy" prize in our home! And to be honest, I'm not sure how to go about it. As parents, we enjoy taking advantage of the family day, yet don't feel any attachment or fondness to the holiday. So, as I write my thoughts out, I think I have coined October 31st as Hallow-whata-day as far as the 5 of us are concerned!